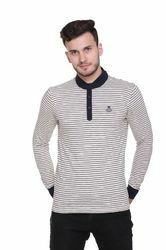 Manufacturer of a wide range of products which include full sleeve t-shirt for men, men's round neck t-shirts, striped t-shirt for men and henley neck t-shirt for men. We can Customise your product accroding to your requirements. 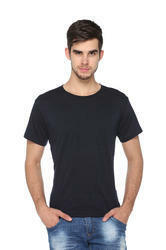 we provide any type of printing and embroidery on the garment of your choice. Enhance your brand and use our products as promotional wear for distribution amongst clients, employees or even as gifts. Packaging Details: Packaging can be done as per customers requirement. 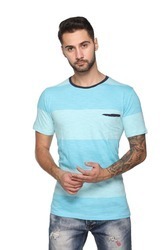 Add an extra dose of style wearing these Striped round Neck T-shirt with Cotton Blended fabric by house of Harbor n Bay.Live the moment wearing this regular-fit T-shirt.